Preheat oven to 350 degrees F (175 degrees C). Line a baking sheet with parchment paper. Whisk together the flour, white sugar, brown sugar, baking powder, salt, cinnamon, nutmeg, and ginger in a large bowl until thoroughly combined. In a separate bowl, beat the eggs with pumpkin puree and vanilla extract; stir in pecans. Pour in the dry ingredients, and stir to make a stiff dough. Divide the dough in half, and form each half into a log about 10 inches long and 2 inches wide. Place the logs onto the parchment-lined baking sheet. Bake in the preheated oven until lightly browned, 25 to 30 minutes. Let the logs cool on the baking sheet for 5 minutes; remove to a work surface and slice the logs into individual cookies about 1/2-inch thick. Use a sharp knife and a light sawing motion to cut up the cookies. Place the cookies back onto the parchment-lined baking sheet. Return the cookies to the oven, and bake until lightly browned, about 8 minutes; turn the cookies over and bake until crisp, another 8 minutes. Let cool on wire racks. A sweet baked treat filled with pumpkin puree and the aroma of fall spices. This recipe was easy and very good. On the second batch I cut down on the nutmeg to 1/4 tsp. as I'm not fond of nutmeg and added 1/4 tsp. of cloves (my favorite). I just got done making this. Delicious! First from-scratch bakery item (outside of home-ec) It was a success in my book! Delicious! 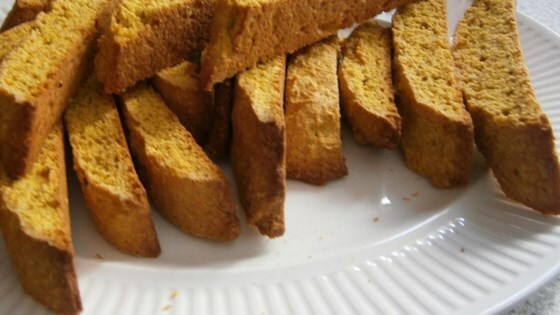 Makes a nice, hard biscotti that stands up to dipping. The spices were perfect. A great recipe for using that last bit of leftover pumpkin.